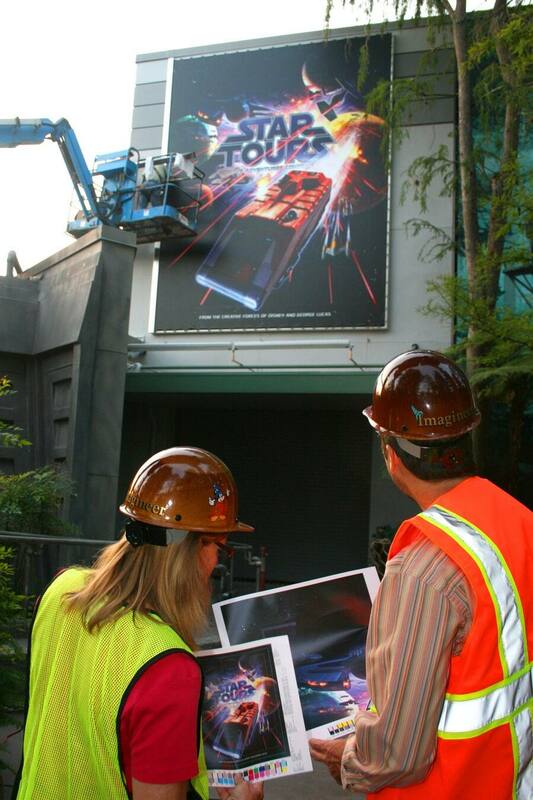 Today, May 4, we unveiled a stunning new piece of Star Tours art which serves as the attraction poster at Disneyland park and the marquee at Disney’s Hollywood Studios. Designed by Imagineer Scot Drake, the piece features the new Starspeeder 1000 surrounded by many of the planets, vehicles and characters from the show. Look for Darth Vader lurking in the shadows. The photo below shows the new marquee as it was being installed just this morning at Disney’s Hollywood Studios. The Adventures Continue – only weeks away! My son and I cannot wait to experience Star Tours – Cool! Now I love looking at things like this in detail and I cant help but notice that after magnifying the cockpit, I see a Twi’lek, Orange Clad humanoid and Teal clad humanoid. Is that a star tours cast member? And on the far right is that GEORGE LUCAS with his signature hair?? 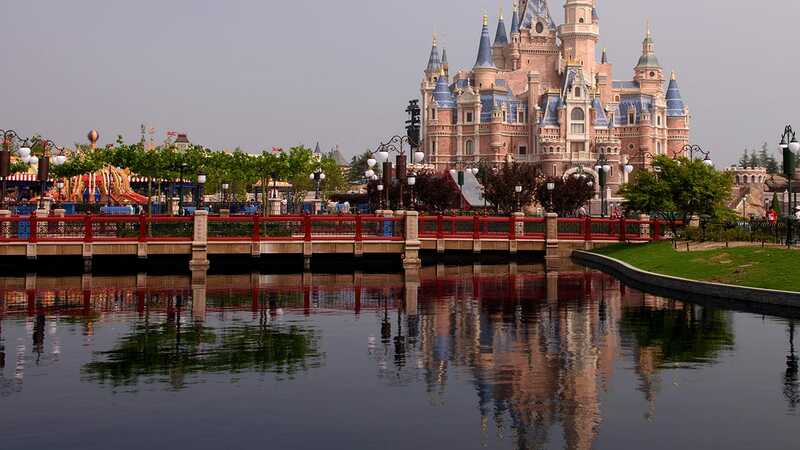 Also hunting over this pic for hidden mickey’s; not sure but Coruscant has some circles that almost make me wonder…. Cant wait to see the merchandise that will be amde available and look forward to seeing what has been made that was previewed at Celebration V last August on the Disney panel! Go Grievous Stitch!!! I’ll be up in a couple weeks and can’t wait to try out the new Star Tours 3D ride. I wish the other parks got some new rides every few years. 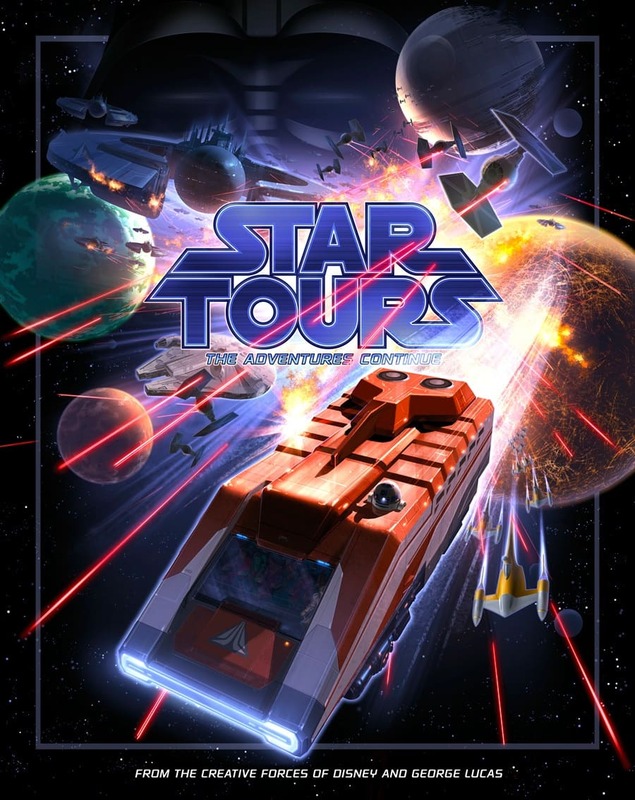 By the way, I love the new Star Tours attraction page on the Disneyland website! Love it! It has such vibrant colors and it has so much elements to it. Only 16 days left until I can hop on one of those Starspeeders and tour the galaxy! It would be awesome if that image was on the cover of the Disneyland guide maps when Star Tours opens there on June 3rd. Love the new poster, it looks great! But don’t TIE Fighters shoot green lasers, not red? What will Walt Disney World be doing with the image the imagineer on the right is holding? Hey! Isn’t that the ship that made the Kessel run in less than 12 parsecs?!? LOVE the new artwork! The 7 year old Star Wars/Disney geek in me is really excited for this!!! Also, I noticed that recently the mural at Disneyland has been updated to show the Starspeeder 1000. It looks great. I second Nicole! We would LOVE to be able to take part of a soft opening as Annual Passholders!! PLEASE! Star wars Weekends Rock!!!!!!!!!!! Thank You Disney!!!!!! Any early test flights for Florida Resident Season Pass Holders??? Can you buy this poster?! I spy with my little eye, THE MILLENIUM FALCOLN!!!!! Awww… no more big Threepio face. Although, I guess you couldn’t very well keep the old artwork up, since Rex is not our pilot in the past timeline.